Directly across Kerr Lake from Clarksville is Occoneechee (pronounced o-ko-NEE-chee) State Park. Named for the tribe of Native Americans who used to live on a nearby island, the park was opened in 1968, 15 years after Kerr Lake was created. Occoneechee offers an impressive array of facilities: Slips are available for boating and fishing; hunting is allowed in designated areas; trails are available for hiking, biking, horseback riding and wildlife watching; the park includes two picnic shelters, a playground and even a 1,200-seat amphitheater. You’ve got plenty of lodging options at Occoneechee: 11 cabins, two lodges, 48 campsites for tents and RVs and 11 equestrian campsites. Cabins and lodges are available year-round, while equestrian campsites are available from March 1 to the first Monday in December. The cabins and lodges are furnished, and the equestrian campsites each have a covered stall. Electricity is available at all equestrian campsites, but only camping sites on Campground C have electricity. Pets are allowed at all Occoneechee lodgings with a minimal pet fee. Call 1-800-933-PARK to check on availability and make a reservation. Cabin, lodge & campsite fees vary by time of year, length of stay & Virginia residency. Call 1-800-933-PARK to get current rates. At the westernmost end of the lake, Staunton River State Park offers fewer lodging spaces than Occoneechee does, but they make up for it with architectural and historical flair. The seven cabins at Staunton River were all built during the Great Depression by the Civilian Conservation Corps, leading to the park being designated as a National Historic Landmark and a Virginia Historic Landmark. 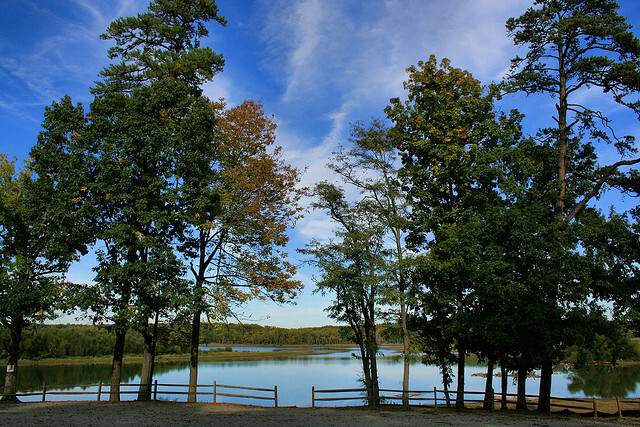 A boat launching ramp is available for boating and fishing; trails are available for hiking, biking, horseback riding and wildlife watching; the park includes two picnic shelters, tennis and volleyball courts and an amphitheater. But its most attractive feature, at least to families with kids, is the pools: an Olympic-size swimming pool with a 70-foot water slide, plus a wading pool. In addition to the seven historical cabins, Staunton River offers a bunkhouse that can sleep up to 14 and 48 campsites. Electricity is available in the cabins and bunkhouse, and all but 14 of the campsites. The cabins and bunkhouse are furnished. While horses are welcome on the park’s multi-use trail, there are no equestrian campsites. Pets are allowed at all Staunton River lodgings with a minimal pet fee. Call 1-800-933-PARK to check on availability and make a reservation.